Nerial’s Reigns (published by Devolver Digital) was one of my favorite games of 2016. It’s an incredibly innovative game inspired by Tinder that manages to make simple binary choices super compelling and even quite tricky. It’s a perfect fit for mobile devices, as all you need is a body part that can swipe left and right and you’re good to go. I didn’t review it, but I did make a thorough walkthrough and interview the developer. The game has been highly successful and, unsurprisingly, has spawned a few games using the same mechanics. But none of them have grabbed my attention until now. Artificial Superintelligence (A.S.I.) is the first official game by the developers of the CARROT line of apps that talk to you in a voice not all that different from Siri’s. I never bought any of them before, but was given CARROT Weather so I could have a reference point for the AI in the game. 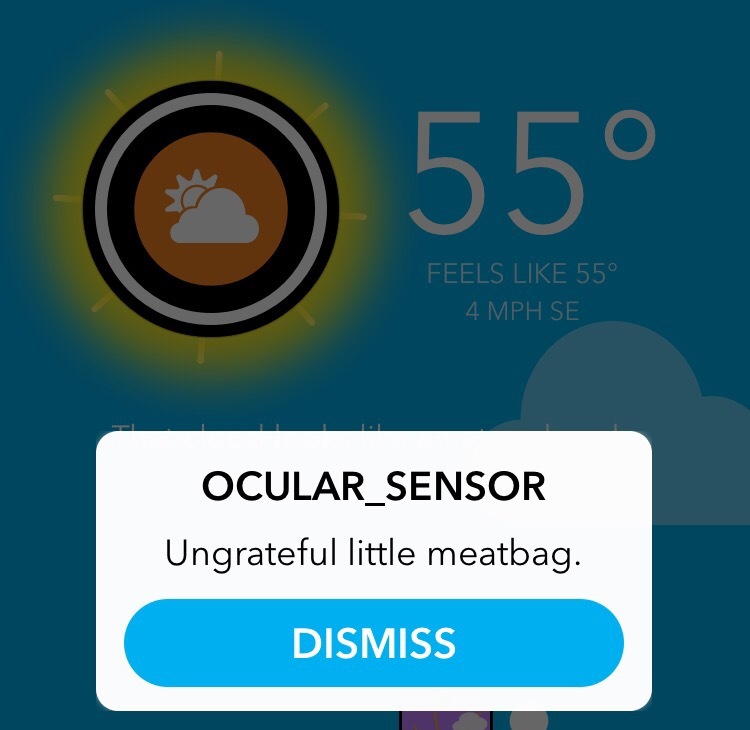 For those who don’t know, the AI is snarky and insulting, and her favorite term for humans is “meatbag.” You don’t need to know all this to enjoy A.S.I., but messing around with the Weather app did give me a greater appreciation for it. 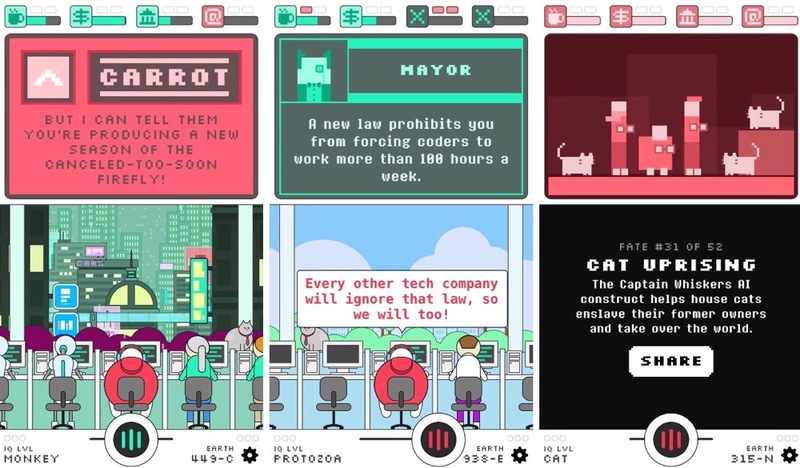 In A.S.I., you’re in charge of a company that’s working to build the world’s first artificial superintelligence, named CARROT. There are four factions you need to keep balanced — as in Reigns. Instead of the church, people, army and treasury, you need to keep the employees, investors, government and internet happy. But not too happy! Just as in Reigns, you need to make the right choices that keep each faction from going down to 0% or all the way up to 100%. If any of them run out completely or fill up all the way, it’s game over. But, as in Reigns, the endings are all part of the fun until you find them all. And sometimes the game will give you a way out — like your mom lending you money or a blogger offering you a guest spot on their blog. While the game does add some mechanics that work a bit differently than in Reigns, I do wish it had stepped out on its own a bit more. Was it necessary to have the balancing work so similarly? Still, the different endings are entertaining even if the basic idea is the same. And I also liked the addition of an interactive environment. Try tapping on things! What held my attention in A.S.I. is the dialogue. CARROT is snarky and rude, offering enough entertainment on her own. But on top of that, there’s over fifty characters to interact with and your own character’s dialogue is incredibly varied. You often have choices between a thoughtful and meaningful response and one that’s dismissive or downright irreverent. You might be given the option to help humanity or just be a greedy jerk — though you do still have to take into account the effect on your factions. There’s also a ton of political references, pop culture references, and nods to random happenings that I almost wish I didn’t know about — like Amazon’s Alexa ordering things she heard off of a TV, or even Pizzagate. If you spend a lot of time on Twitter and pay attention to memes, what’s happening in Silicon Valley and other cultural goings-on, you’ll appreciate the humor here. There’s just so much stuffed into the game. And, thankfully, while there are jabs at our current president, you never have to see his face or hear his name. A lot of the humor might be cheap and easy, but it kept me entertained nonetheless. Maybe I’m a cheap and easy meatbag. From what I can tell, there’s no meta puzzle like tricking the devil in Reigns. Instead, you’re working over time to build a super-AI. You jump between parallel universes where things might be slightly different from our own or vastly different — such as no life ever existing, in one instance. But once you achieve a new AI IQ level, it stays consistent even when you die. To upgrade it to the next level, you need to stay alive long enough to get through a few specific steps of programming. If you lose before that happens, you’ll have to start back at the first step. But you never revert to an older level — even though it may seem like it sometimes. It wasn’t so easy for me to make that jump to the final IQ level, but when I finally managed it, I was pleasantly surprised to see that the game opens up even more from there. This is the point where you start to try to last as many days as you can without ending the world — like the years in Reigns. There’s a leaderboard for it and it does give the game more replay value, but I find the score harder to predict. A day can take a surprisingly long time to pass, whereas with Reigns it’s basically one decision equals one year. And just like I didn’t have the patience to read through the same text over and over to try and compete in the Reigns leaderboards, I don’t see myself doing that here either. I’ll likely play more to try and find the last few characters, items, endings and missions I didn’t see, but I don’t know how vigilant I’ll be about it. A.S.I. is not as slick or as sleek as Reigns, but I think it does a great job achieving what it sets out to do. I personally am not a fan of the two clashing art styles and would have done away with the pixel art, at the very least. It’s a bit jarring, especially at first. It also makes it harder to tell who’s talking without having to read their names. With Reigns, the characters were easy to tell apart once you were introduced to them. Having tried the CARROT Weather app since playing the game, I’m not even sure how the pixel art relates to it all, as the Weather app has a very modern look with clean lines. It’s easy on the eyes, whereas A.S.I.‘s aesthetic feels very cluttered and can be hard on the eyes. In fact, I initially had some doubts about A.S.I. because of the screenshots I’d seen. But I’m glad I didn’t dismiss it over its appearance, because it’s been a great source of entertainment over the past few days. Unfortunately, A.S.I. didn’t just borrow Reigns‘ good ideas. It suffers from similar issues found in its inspiration. After you’ve unlocked a large number of fates, missions and characters, it begins to feel repetitive. You see the same lines over and over and trying to find something you missed can get tedious. It can also get difficult to figure out what single choice you need to make to set you on the right path for a specific mission or new ending you haven’t seen yet. But there’s still a ton of content stuffed in here and it’s worth sticking with at least until you see most of it. The humor is the biggest draw here, especially if you already played Reigns and don’t feel the need to experience those mechanics again. 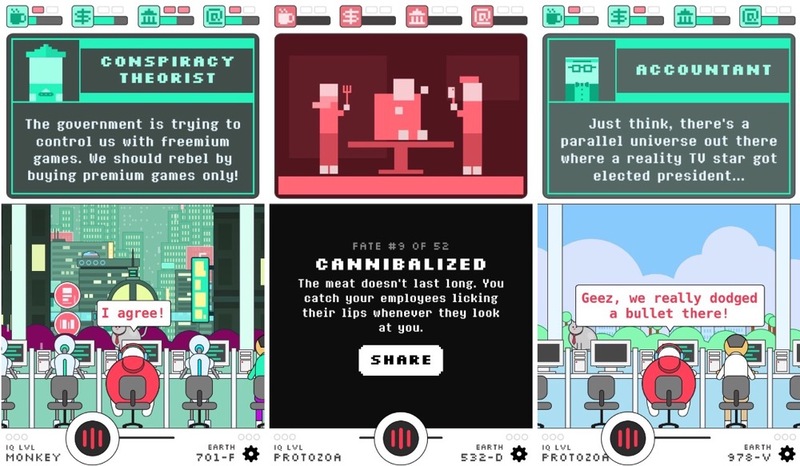 It would be easy to dismiss Artificial Superintelligence as a Reigns clone, and no one can really fault you for it. But it’s obvious that a lot of love went into making it and it wasn’t meant as an easy cash grab. Even the volume pop-up has been designed to fit the game’s aesthetic, which I didn’t know was possible. Perhaps this is one of those situations where stealing really is the sincerest form of flattery. I do wonder if the game would have been better if it tried to do something more unique instead of copying all the Reigns mechanics, however well it works here. I would have liked to be able to talk about it on its own merits and the enjoyment I got from it. But because it relies so heavily on a game that isn’t quite a genre yet, it’s too hard to ignore the similarities. So my recommendation is this: first play Reigns and then when you’ve had your fill of that, play A.S.I. It has its own personality and definitely does enough differently to be worth playing. But the original is still the slickest and sleekest. Reigns has style, while A.S.I. is a bit rough around the edges and doesn’t feel quite as unique and fresh. 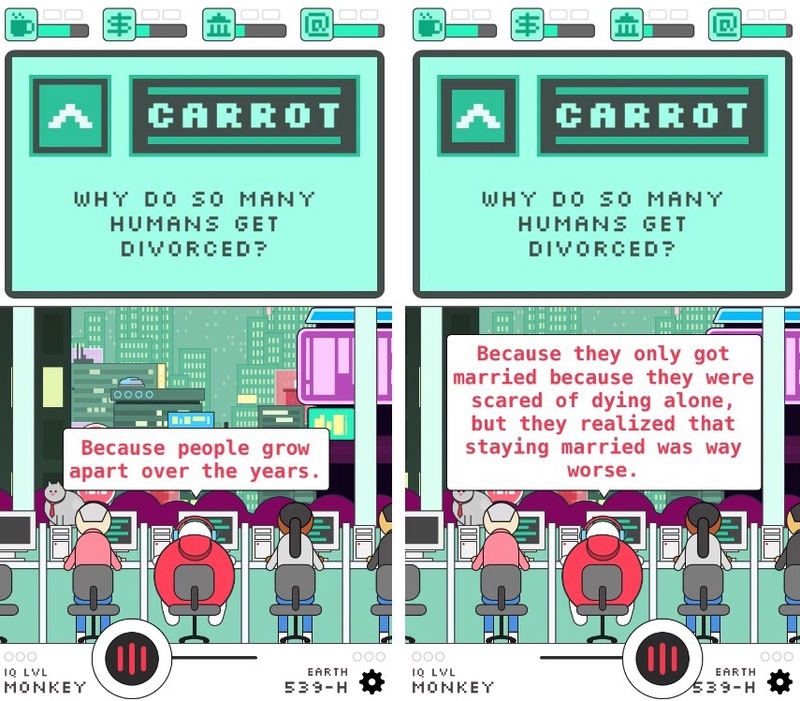 But if you like the sense of humor in the other CARROT apps, it’s a pretty safe bet that you’ll get a kick out of Artificial Superintelligence. So what are you waiting for, meatbag?! Download the game here.